​I would like a payment agreement, is that possible? Yes. For every commission an order and an agreement is made. We can easily include a payment agreement in it. We decide together what the conditions of this payment agreement will be, so that we are both okay with it. A payment agreement comes without extra costs. This does not include any bank charges on foreign transactions. I would like you to work from my own photo, what are the requirements and how should I send them? You send the photos to me via WeTransfer. I’ll select the photos first on suitability. It is important that you take in account the copyrights of the photographer. I don’t have an appropriate photo, can you make one for me? I work together with photographer Nikki de Kerf. She is specialised in photographing horses and I can highly recommend her. Prices for photography upon request. I would like a drawing of my horse; what’s the process? Usually we do not meet in person for drawings. A telephone call is often sufficient. You can send the required information to me via e-mail. In what time is my commissioned painting ready? Currently we have a waiting list. Which causes a portrait to be ready in 4-6 months after the order confirmation. Unless otherwise agreed. I would like to give a painting to someone as a gift, is that possible? Of course that is possible! However I advise you to engage the person in this gift, and not hand over the finished painting as a gift. 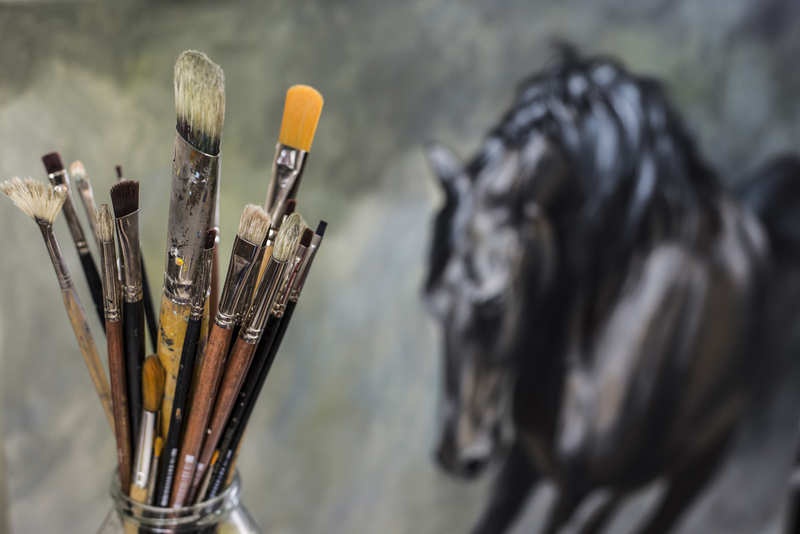 The process of creating a portrait of a loved one, in this case their horse, is very personal. In order to recreate the personality of the horse the information provided by this person is crucial for me. Their story, their choice of picture and their emotion is what brings my artwork to life. Also the possibility of meeting the horse in question is important. Acrylic paint is based on water. Acrylic blends differently than oil. Acrylic paint dries faster which gives less ability to mix the paint on the canvas or layer the paint. The gloss and intensity of the colour is also different from oil paint. This is because the pigmentation in water is much more condensed which causes it to reflect less light. Oil paint is used for centuries when painting portraits and not without reason. The reflection of light in the different layers of oil paint makes the painting lively. Acrylic paint sure isn’t less good, but gives another result. Therefore I choose to do commissioned pieces in oil paint only. Do you only draw horses? I chose to specialise in painting and drawing horses. That is not to say that I can’t or don’t want to paint other subjects. However, they are not part of “Equine Portraits with Character”. I strongly prefer to paint horses, because I am (very!) good at it and very passionate about them. In the past I have also painted dogs, cats, Asian themes, Argentinian tango scenes and people. If you have a specific request please just contact me and we can discuss your wishes. I live abroad and wish to have my horse (s) portrayed by you. Is this possible? Yes, this is possible. We will discuss the possibilities in terms of process together. Depending on your location in the world, we look into whether it is possible for me to meet with you and your horse on your location. When visiting on site abroad, the costs of the ticket and stay will be charged. Or we can decide to contact through Skype or video chat and send the pictures with video's through Wetransfer. Some form of personal contact is required. I am not here to 'replicate' photographs. But I use a photograph as a reference for my work. Adding more photographs, (video) information and personal contact will add to the quality of the portrait. The painting or drawing can be internationally shipped by DHL and the costs are additional to the artwork. Additional costs like travel fee, tickets, stay and shipping can be included in an estimate.